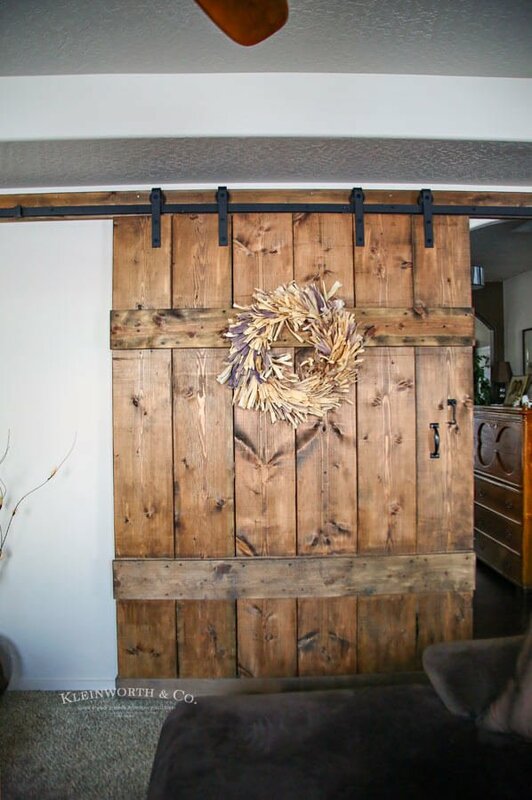 This Wide Rustic Barn Door is 6 feet wide & made for extra large doorways. 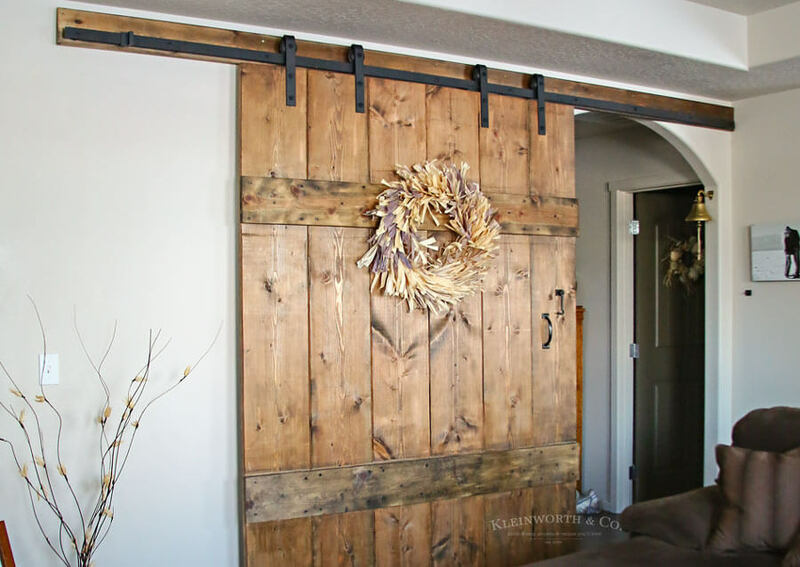 It’s incredibly simple to make & adds functionality & rustic charm to your home. If you follow me on Instagram, you may remember back at the beginning of December mentioning that we had to built a door because we needed to keep the cats away from the Christmas tree. You see, when we build the house we added doors on the front room with the intention of setting up the tree in there- where we could close it off to the cats. 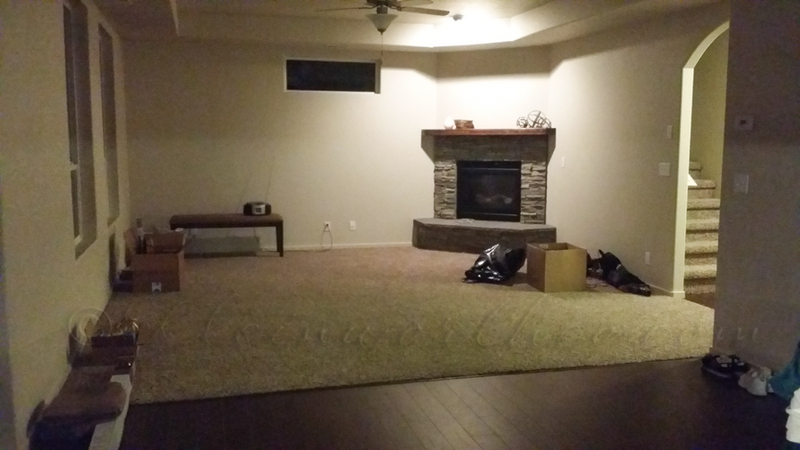 Well, we changed the furniture situation in there & the tree just wasn’t happening in there anymore. So our only option was to put it in the family room. Unfortunately, we have a cat that loves wires & another that is about 20lbs but thinks he can perch on top of things that can’t support his weight. We had to close off the space to them for the month. 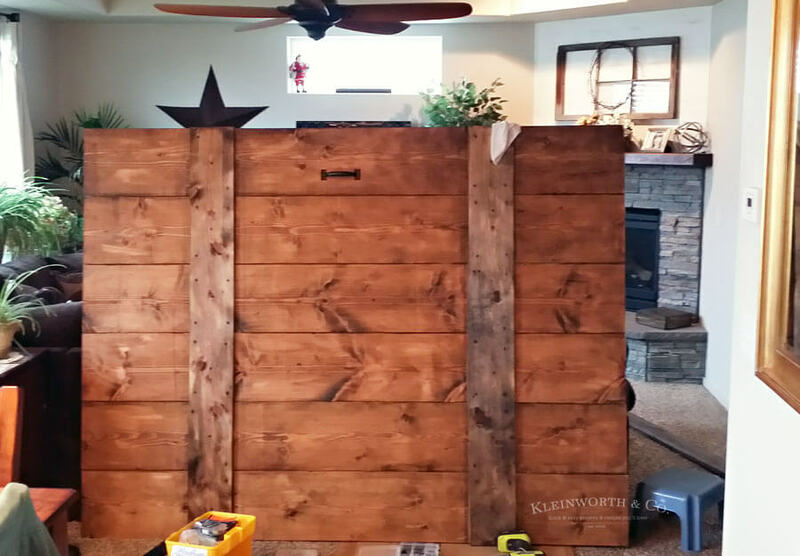 This gave us the push to build the barn door we had been discussing since we moved in 2.5 years ago. This is the pace the evening we got our keys. You can see there is a large archway coming into the room that ends into a flat wall. Putting double sliding doors pushing out from the center wasn’t an option. We had to go one direction, which meant this door we were building needed to be a minimum of 6 feet wide. That’s a BIG DOOR! 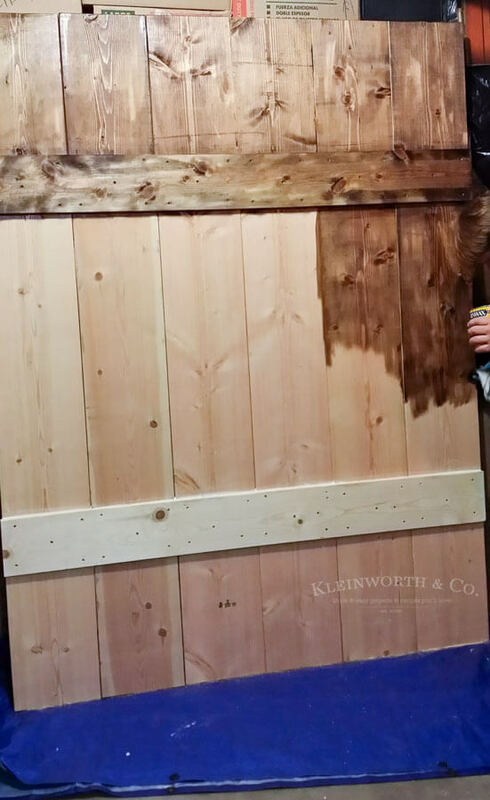 We started with 6- 12″ wide planks – 8 feet tall. Then just screwed 2 – 6″ wide boards across them all. 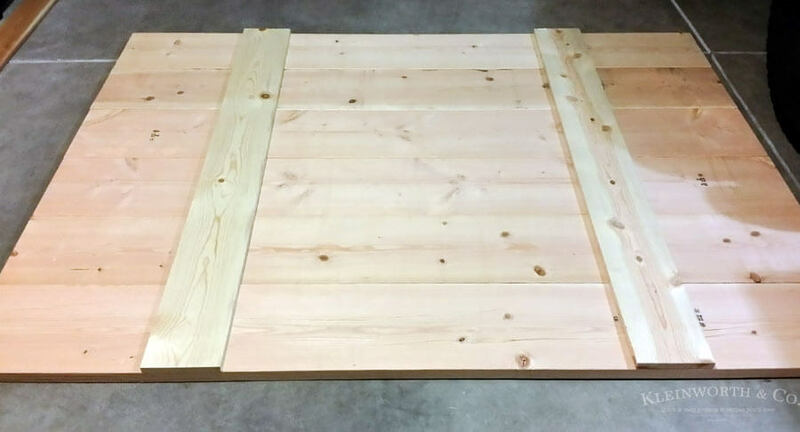 There’s 5 in each 12″ board at each end – imagine a cross pattern to attach it to the smaller plank. Once assembled, we stained with a light coat & wiped away. Once dry we brought it inside & added the wheels to the bottom & the hardware for the the slider. With the golden sunshine coming in through this part of the house it looks so much warmer at this moment. But I have to say, the Jacobean is quite cool & more true to the final images you see here. Once we had everything attached to the door itself, we were able to mark where the support beam would attach to the wall & then add the slider hardware. 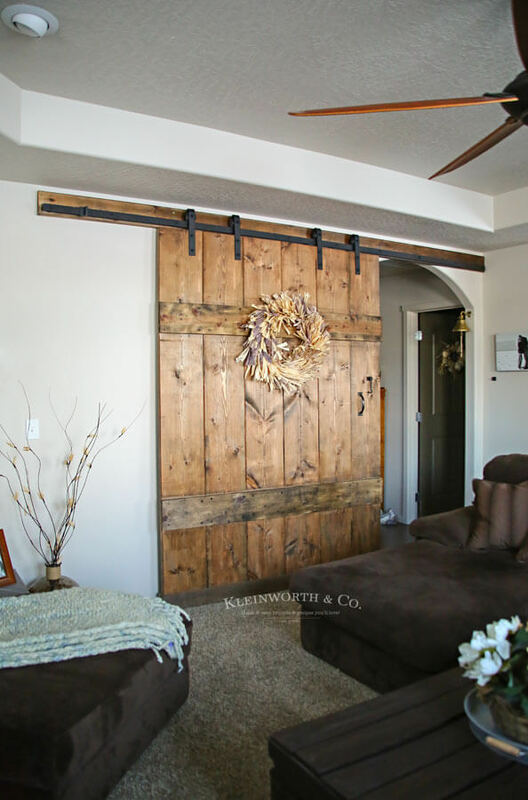 Because we were dealing with an arch with the coffer immediately above it, we didn’t think the framing or drywall for the arch had enough strength for the weight of this door. It’s probably close to 250 lbs & we didn’t want to risk it. 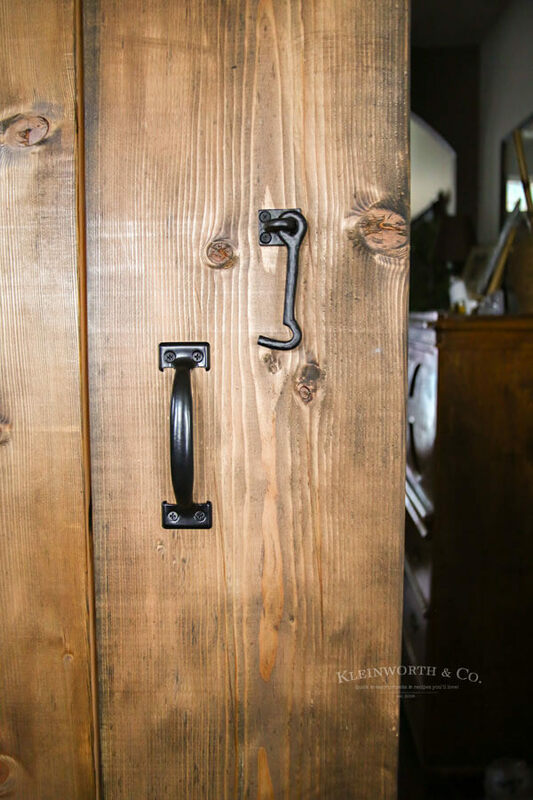 So we used some good screws & the plank to give the slider something to really hold onto. Each hardware kit is a little different – for this I have to say- follow the directions! We added the accessories once we got it hung in place. You can see here that we added additional skirting around the bottom to conceal the wheels. This is completely optional. 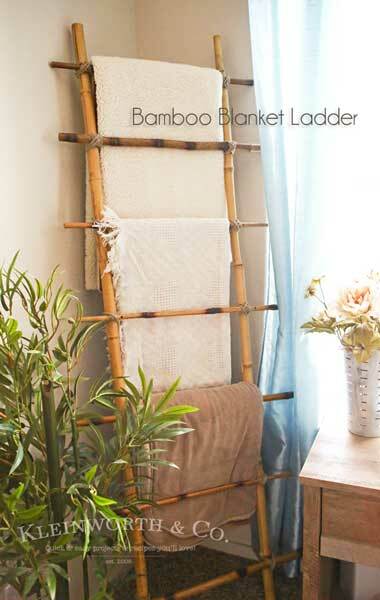 If you choose to do this, it’s just very thin plywood that we cut into 4″ wide strips & used the nail gun to attach it. I had not planned on adding anything to the front of the door, but one of the kids held the Christmas wreath up against it while we were decorating & I really liked it. We added a hook & had a fresh pine wreath there for December. I loved the look & decided a wreath really needed to be there all the time. Pretty simple – right? I love being able to close off this space when I need to & do it with style! 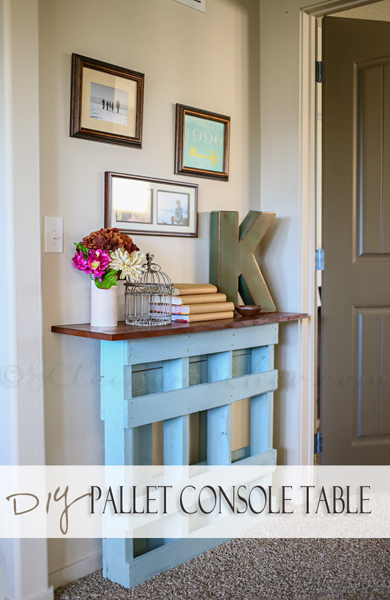 I love that it still fits with our coastal vibe we have happening here & yet adds enough texture to be interesting! 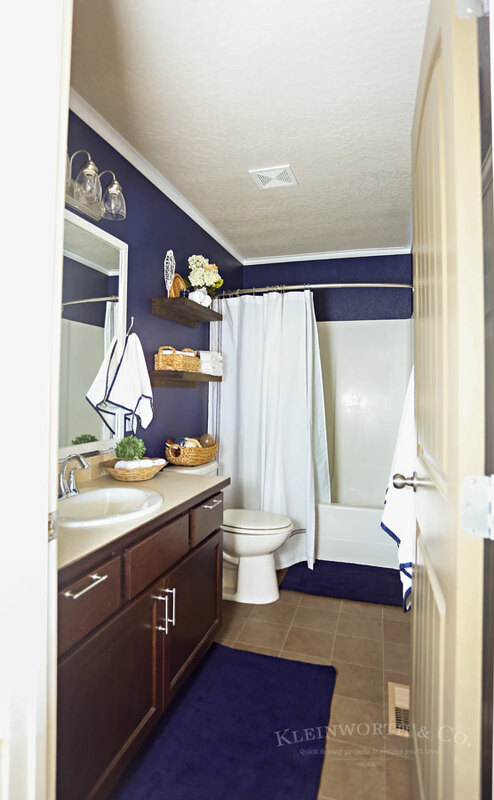 Looking for more project ideas from our home? That is amazing!! I love how creative you are! 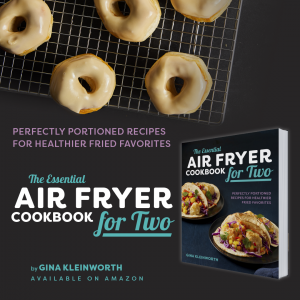 Gina, this is so creative – I LOVE it! I hope everyone takes the time to read your post so they can find out there are WHEELS hidden down below. WOW! 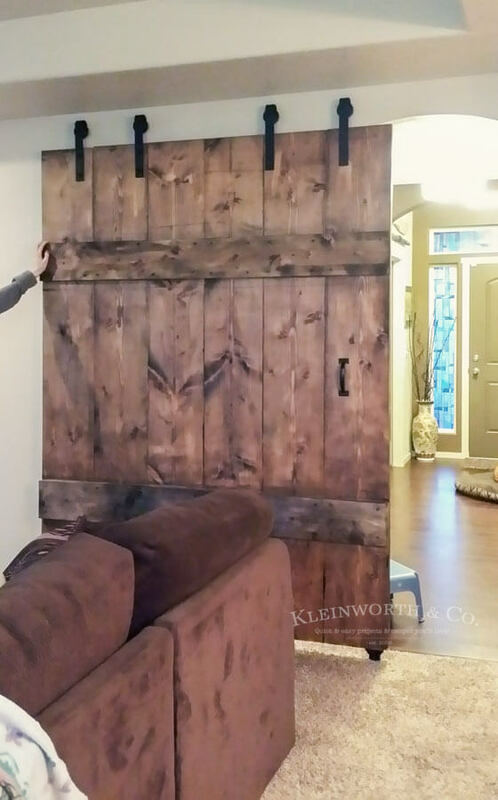 That is such a gorgeous barn door – and six feet wide! That really is massive. I love that you trimmed the bottom out with skirting. It really finishes the door off beautifully. Also love the imagery of a 20-lb cat trying to perch in a Christmas tree. We’ve had cats before, so I can completely see that happening. Beautiful solution to a practical problem!